It’s easy using promotional products. You pick out a few cool items, get them imprinted with your logo, and hand them out to your target audience. Bam – you’re done. Well, there’s a lot more to it than that. Using promotional products is an investment. If you want your investment to pay off, there are some important things to keep in mind. In this blog post, we’ll explore some do’s and don’ts of using items imprinted with your logo. Who’s going to be on the receiving end of your promotional products? If you want your giveaways to be effective, you first have to know who will be receiving them. Take a moment to revisit your customer profile. Looking at demographics, you should have insight such as customer age, gender, geographic location, income range, education, and more. Digging a bit deeper into the psychographics, it’s helpful to know lifestyle information such as hobbies, attitudes, behaviors, values, interests, and the like. So, why does all this matter when it comes to promotional products? This information helps you in two important ways. First, knowing these details about your target customer allows you to adjust your product or service to best accommodate what your customers need. And second, it clues you in to how to reach your customers with your marketing and promotional efforts. If you know, for example, that your core audience is businessmen who golf and work in large metropolitan areas, it makes sense to give them golf-related items – maybe nice golf shirts they can wear on the course or at the office, or perhaps leather golf accessories. If you’re marketing to rural agriculture workers, golf probably isn’t the best way to go. Instead, you’d want to look at items they could use in the field – perhaps a hardy pair of gloves or a custom work jacket. When you take the time to get to know your target market, your brand appears smart and a whole lot more relevant to the people you want to reach. One of our clients tailored its promotional products specifically for recipients. It set out gourmet chocolates on a copy of The Wall Street Journal for corporate jet passengers. How smart are these promos? It’s a small gesture, but it goes a long way toward creating a memorable experience and building brand loyalty. DO learn from other businesses. Take some time to study the promo items that other companies have used, and figure out why they selected those products. Are they directly related to the brand? Are they quirky and unique? Here’s a write-up on our blog that discusses this very topic. It’s especially helpful to pay attention to the businesses in your niche. Have you noticed that other pediatricians are handing out drawstring bags for kids? Or that all the gyms in your area are distributing sports bottles? Don’t run out and order bags or sports bottles. The idea here isn’t to directly copy your competitors. If you do this, you’re already one step behind. Instead, take their strategy and make it better. Think about how you can improve on what they’re doing. Every time you see someone using a promotional product from a competitor, you have great insight into what customers want. Going back to our examples above, you could give out drawstring bags with built-in water bottle pockets or distribute sports bottles with attached carabiners. The trick is to find out what works and take it to the next level. DO think of clever ways to grab attention. When you use promotional products, you don’t have to resort to the same old, same old. Let’s say you always set out a mug filled with pens or hand out key chains to passersby at a tradeshow. It’s what you’ve always done, and it’s what you think works. The thing is, though, you’re missing out on an opportunity for epic creativity. Think about ways to really make an impression on your audience. It could be the products themselves, or it could be the way in which they’re delivered. Check out this guerilla marketing stunt heard ’round the world. We’re not saying you have to try and one-up your competitors as DHL has done. But the brand’s stunt was anything but boring – and that’s what your promotions should aim to be. People are busy. They’re bombarded. They don’t have time for anything that’s dull or mundane. It takes a clever approach to get noticed. Street teams or brand ambassadors. Sending people out in branded apparel to hand out freebies allows you to get face-to-face with potential customers. Your promotional products aren’t just background items – they’re front and center. Click here for a great example that any company could easily pull off. Interactive promotions. Don’t just hand out your promos and be done – make them fun and exciting. Send people on a scavenger hunt to find your giveaways. Give out one component of your giveaway, and have prospects come back the next day for the second piece. The idea is to engage with people – not just hand out free stuff. Here’s an interactive promotion in action. Incentives. Use promos as perks when you want your customers to do something. Are you seeking more reviews for your restaurant? Want to generate more referrals for your new business? Want more likes on your Facebook page? Motivate people to take action by offering up promotional products. We’ve had success using promos as incentives here at ePromos, too. When we wanted to spread the word about our Facebook page, we ran a contest in which everybody who liked our page was in the running for a great Ogio duffel bag. Sure enough, our likes skyrocketed and we boosted engagement on the page. People love free stuff, and they’re more willing to do what you’re asking if they have the chance to get it. Just make sure the giveaway is universally appealing (everyone can use a duffel bag), or something that you know your audience will appreciate. The key lesson here is: Be creative. Out with the boring and in with the bold when it comes to using promotional products. 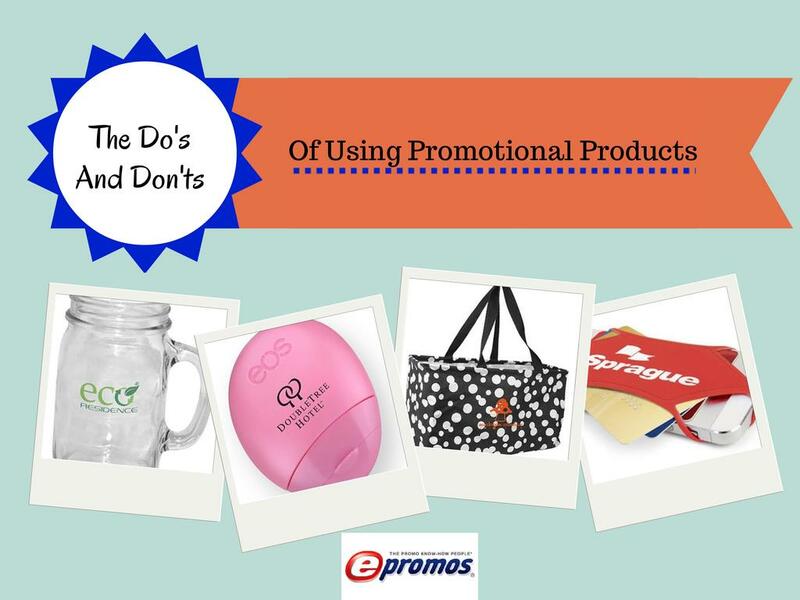 Now that you’ve learned some do’s when it comes to promotional products, let’s examine some of the don’ts. Remember what we mentioned at the beginning of this blog post? Promotional products are an investment. Don’t sacrifice quality to save a few bucks. Your brand image is on the line. If you go for the cheapest products you can find, people will correlate those giveaways with your brand. That’s not to say you need to shell out big bucks for your promotional items to be effective. You can create a stellar promotion and still keep well within your allotted budget – just don’t make price your only consideration. Do your research. Think about what you want your promo items to accomplish, and what your target audience would actually want to receive. You’ll be better off using promotional products (even if there are fewer of them) that are interesting and appealing to recipients than getting a truckload of the cheapest items around. You know the adage: You get what you pay for. It’s true with promotional items, as well. Give your customers and prospects a cheaply made giveaway that breaks or falls apart, and you have a one-way ticket to the trash can. So much for that brand exposure you were hoping for. Don’t cheap out. You’ll invest more money up front, but in the long run, it pays off for your brand and how it’s perceived. There are some promotional products – think hygiene products or political products, for example – that make sense only for certain companies and campaigns. If you give people something that makes them feel a little off, do you think they’ll have positive feelings about your brand? No way. Creativity is good, but don’t cross the line and make people feel weird or uncomfortable with your giveaways. The last thing you want to do is upset your customers or turn them away from your brand. A promotional toothbrush is a great giveaway if you’re a dentist. If you’re an accountant, well, not so much. Not only is the promo strangely out of place, but it could send the vibe that your clients have bad breath. They’d be weirded out that they just got a toothbrush from their CPA, and they’d think about it every time they interact with you. The same thing is true with political products. Unless you’re running for office or you’re a campaign manager, it’s best to steer clear of any promo that might tip people off to your political leanings. People are passionate about politics. If they can see that your views don’t line up with theirs, you can kiss that brand loyalty goodbye. You also don’t want to step on anybody’s toes by handing out blatantly political items (think bumper stickers or pins with a candidate’s name) or even subtly political promos (think donkey-shaped stress balls or elephant-shaped stickers). If you’re not directly in the political arena or striving to make a political push, it’s best to remain bipartisan. Go patriotic instead with red, white, and blue promos or American-made items. And when it comes to hygiene products, by all means, leave the toothbrushes for the dentists. Otherwise, it’s just too weird if it has nothing to do with your brand or promotion. DON’T hand out promos without a strategy. Do you have a game plan for your promotional products? If you’re not sure why you’re giving them out, then don’t do it. Take some time to figure out what you want to accomplish. You should never invest in promos without knowing why you’re making the investment. You’ll simply be flinging freebies at people with no solid goal in mind. Brand awareness – Do you simply want to spread the word about your business? Customer loyalty – Will the products be given out to retain current customers? New business – Do you hope to win new customers with your giveaways? Employee recruitment – Is the purpose of the promos to attract new talent to your business? Incentives – Are you hoping to use the items to motivate your audience to do something? Thank-you gifts – Will the promotional products be used as tokens of gratitude? This is just a sampling of some of the reasons to give promo items. But it’s a good place to start if you’re unsure why you need to be using promotional products. It’s also smart to think about what’s on the horizon for your business. You may uncover some hidden gems when it comes to distributing custom logo merchandise. These are all prime opportunities to get your promo items into the hands of your customers and prospects. Does it take time to develop a strategy for your promotional products? Yes. But it’s so worth it. You’ll have a clear vision of what you want to achieve, and you’ll have some actionable ideas on how to make it happen. If, a few minutes ago, you thought using promotional products was as simple as putting your logo on something and handing it out, we hope we’ve cleared up that little misconception. Promotional products are powerful, but you have to know how to use them. Take the time to know who you’re marketing to. Pay attention to what other businesses are doing. And be creative. Promotional items shouldn’t put people to sleep – they should catapult your brand to a whole new level. Want more? Click to see some eye-opening stats about the effectiveness of promotional products. Do you regularly use promotional products to market your business? What other tips can you share? Can Promotional Products Reflect Your Company’s Brand? See all the posts by Audrey at this link.